Thank you for your interest in becoming an AGD-approved program provider of continuing education. Please download the application for constituent program provider approval here. Make TWO copies of your PACE application. Send one to Texas AGD and keep one for your records. 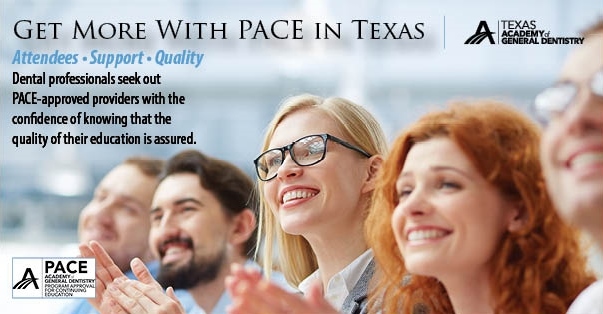 Please complete the local PACE application and return the completed form with the required attachments to the Texas AGD office with your check. Your PACE application will be reviewed by a member of the PACE Approval Committee, and you will be notified within six to eight weeks concerning the status of your application. For any additional questions, please contact us and ask for PACE Division at 512-371-7144 or by email. Please write "PACE + your provider name" in the memo line of your check.